While the figures are huge, their global nature suggests the channel is not suitable for a localised business. An estate agent in Plumstead doesn’t need to speak to people in Seattle, Paris or even Edinburgh, for instance – their target audience is likely to reside within a 20-40 mile radius of London. You can target these locals on a global medium, though. In this article, I’ll talk about a few of the ways you can do it. As with any marketing initiative, the first step is to understand who your audience is and where they are. You can then explore which social platforms they are most active on and what types of content they like to consume and share. Discovering everything you can about your target audience and using that data to build your brand’s community is what every social media marketer should be striving to achieve. There are many tools available to help you monitor and track your social audience, so let me introduce you to a few of our favourites. Ok, this may seem like a bit of obvious one but Twitter’s search functionality is still one of the most effective ways to locate your audience. 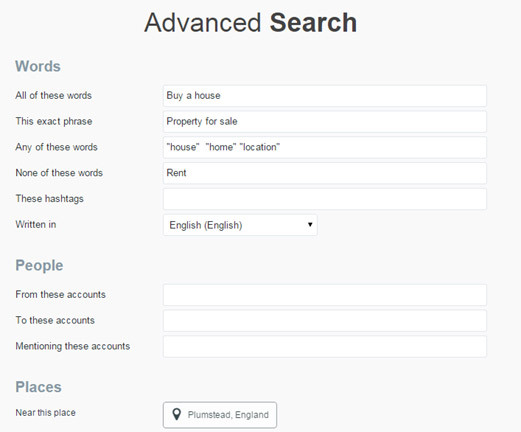 Search by multiple keyword, location and specific account. Not only can you see who is searching for what, you can also make sure your content is showing up for specific user searches. If you are a local estate agent, the audience you want to attract will be within the catchment area of the properties you have on your books. One great way to ensure you are only appealing to this audience is by putting your business at the centre of the community. Talk about local events, shops, restaurants etc. Describe your local area in the best way possible – you know what they say; location, location, location. 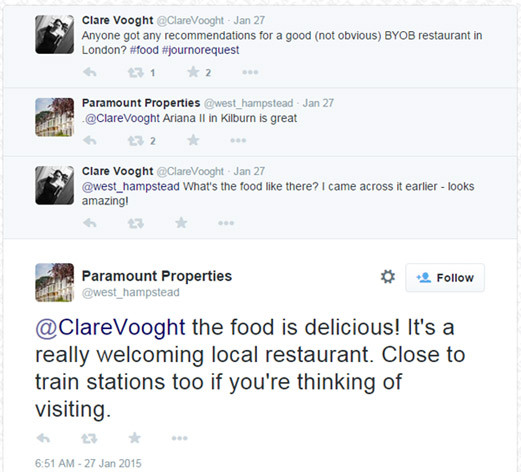 Hampstead-based estate agent Paramount Properties did this particularly well in the example below. With a simple comment on a local restaurant, the company has painted its local area in a positive light and shown itself to be knowledgeable, friendly and, most importantly, human. Buzzsumo is a very cool tool for not only discovering what content is being talked about most in your industry but also where that content is being shared. So, as a local business, you can search by city or town and see what your local audience is interested in. For example, if you are a local government authority or university, you may want to find what content is most pertinent to your existing and prospective students within a specific catchment area. This will help you to create and share content that is likely to be picked up by the audience you are targeting. 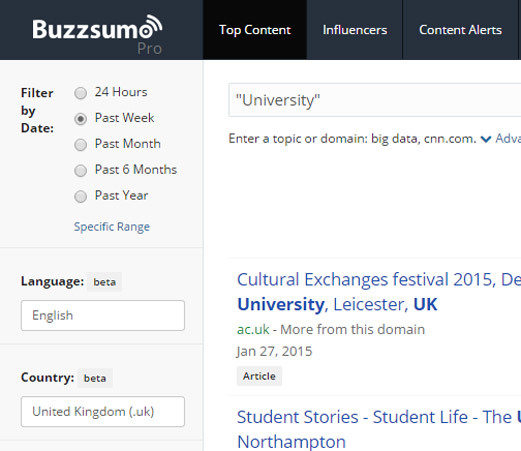 A search within the UK for the word “university” reveals posts on different social networks by people using that word. You can use more granular phrasing and drill down to a locality to narrow the search. 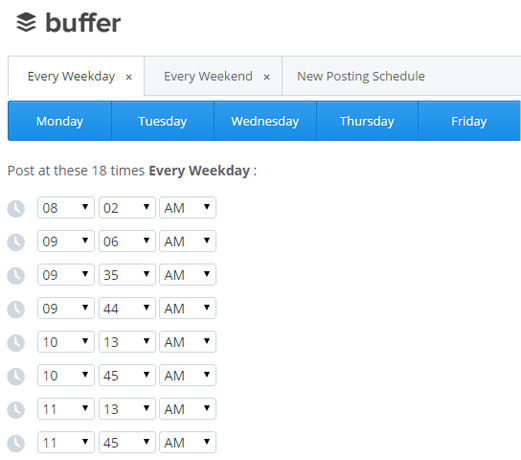 Buffer is one of the most popular social media scheduling tools available. It allows you to space out posts on Twitter, Facebook, LinkedIn, Google+ etc. throughout the day, at the most effective times. This does not specifically help you find local customers, but it does help you post content for your local audience at the most suitable time. For example, let’s say you have identified that a lot of people in your area tend to post online at certain times of day; you can then schedule some key content to go out when you know they are more likely to see it. Buffer lets you schedule posts in advance, so you don’t need to remember to be online at the right time of day to post things. Sprout Social is a powerful social media management platform. Using Sprout’s Discovery tool, you can monitor everything from chosen search term keywords and it will suggest accounts to follow based on previous interaction. You can also keep a close eye on what profile trends are popping up in your social world: the most popular hashtags, which profiles have the most interaction with you and, most importantly, a breakdown of your social media reporting metrics and follower demographics. 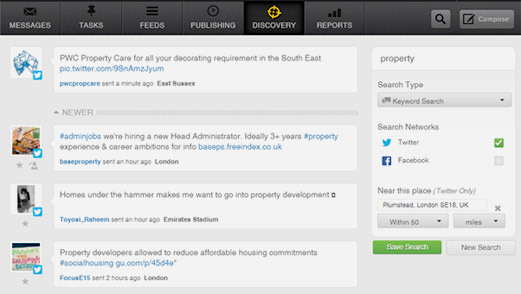 Use the Discovery feature in Sprout Social to search on local phrases. Pinterest allows you to search keywords being used around your business locality to find images shared by people within specific areas. In this example, we simply searched for “Plumstead” as a starting point. 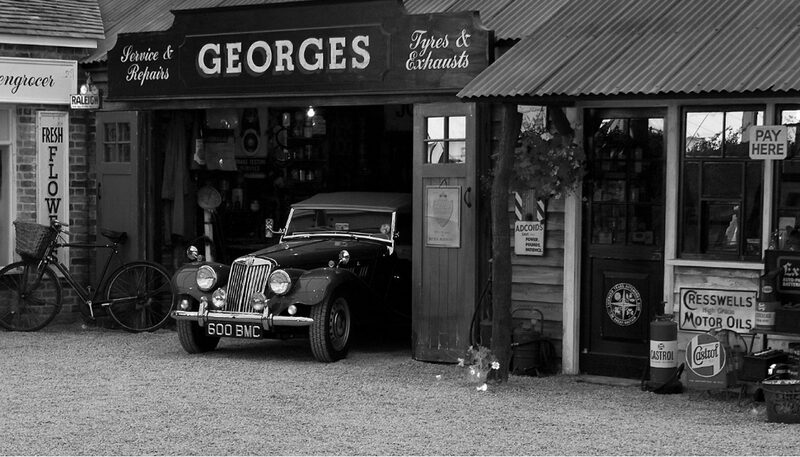 A number of pins comment on the local area throughout history, which could be an interesting angle for a property business. 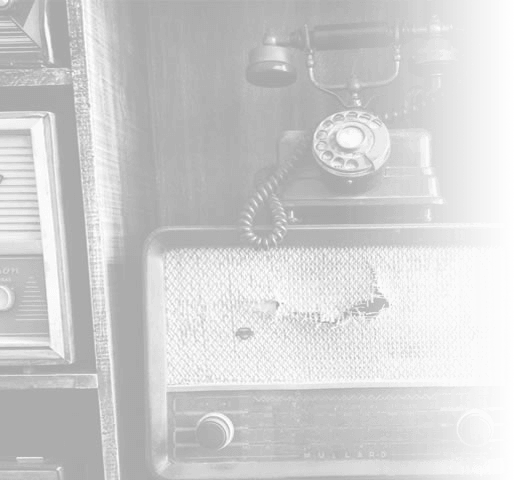 With a content-minded approach that includes properties currently on offer mixed with a nostalgic view of the local area, a business can develop a knowledgeable and human connection with a target audience. Search Pinterest for localities to find boards dedicated to your local area. Use Facebook’s search function to find pages related to your local area. Monitor these specific pages or places, such as news sources and local businesses, to align your page content with key related topics. By sharing and commenting on appropriate pages, you increase the visibility of your own page by association. The other users commenting and sharing this content could be your potential customers. Be aware that as a ‘page’ manager, you will not be able to comment on community discussion groups. People posting on those pages are potential customers. 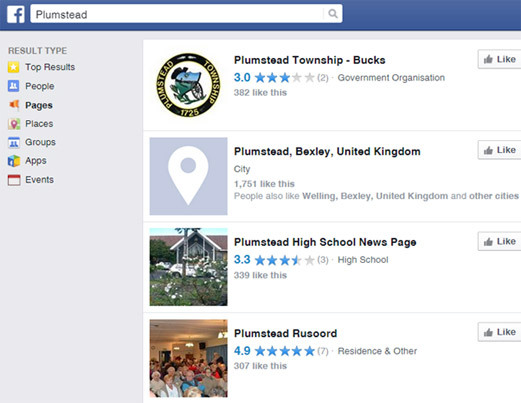 In this example, we searched Facebook for Plumstead and filtered the results to show only pages. By putting your business at the centre of your local target audience on social media, you will gradually develop an authority within the area. What’s more, the data you gather in the process will help you massively in the future. Try a few of the tips above and let us know how you get on. Get in contact to find out more about how Vertical Leap can assist you in your local social strategy. Alex has more than 5 years’ experience in social media & digital marketing, focused specifically on content/social strategy for B2B/B2C corporations. Alex has a particular interest in video production, blogging and the use of humour, where appropriate, to drive brand awareness and audience interaction through creative and engaging content. He is a keen musician, film maker and comedy writer.